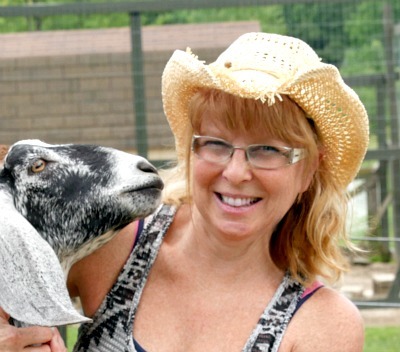 Tracy Lynn is the founder of Simple Living Country Gal and Our Simple Homestead. Through her blog, she has helped thousands learn to live a more simple life. Through her motto Make it, Raise it, Grow it she has taught people how to grow their own food no matter where they live. From raising goats and chickens to preserving food grown in their gardens she guides and encourages folks to be more self-sufficient for the benefit of their homes and their families. She lives in Northwestern Pennsylvania with her Hubs, goats, chickens, and family pets. I would love to discuss any opportunities for sponsored posts, product reviews, or brand ambassadorships. SLCG is a great place to promote your product or business. Our site has over 125,000 monthly pageviews and 5,000 email subscribers. The readers here at SLCG are primarily woman ages 35-60. They are interested in all things simple living. They love gardening, raising chickens and other animals, paring down and decluttering. They realize that in order to live a more simple and healthy life they need to take control of their own homes and kitchens by growing more and buying less. They are passionate about simpler times and love to purchase products that help them to achieve just that. Tracy Lynn is active on many forms of social media, including Facebook, Pinterest, and Instagram. She is currently working on her YouTube channel that will be launching in a few weeks. 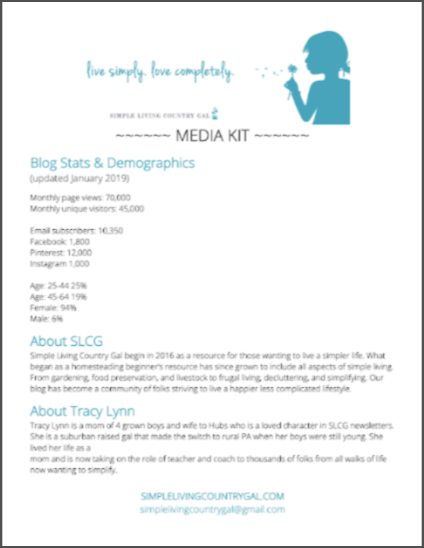 Underwritten Post or Series: Sponsor an in-depth post written by Tracy Lynn of your choice of homesteading or simple living topic. Unlike standard sponsored posts or reviews, these high-quality posts generally receive continuing attention on Facebook and Pinterest and are always optimized for great search engine results. Freelance Writing: Tracy Lynn is available for both one-time and regular freelance writing assignments. She writes on a wide variety of simple living topics. From homesteading and gardening to decluttering and frugal living. Contact [email protected] to discuss further opportunities. This blog is solely written and edited by Tracy Lynn and all opinions expressed on this blog are her own. She gives full disclosure on all forms of paid advertising and giveaways.